Wild Cucumber is part of the Cucurbitaceae family, which also includes the garden cucumber, melons and the pumpkin. It's the only native cucurbit in Quebec. 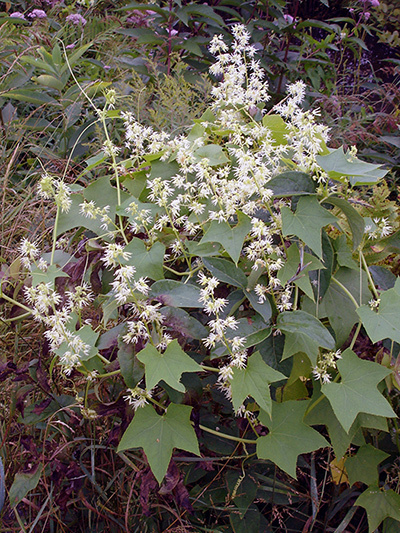 It's a climbing vine with tendrils, because of this it is sometimes considered a weed as it can uproot young plants or literally choke a larger plant. Wild Cucumber is monoecious ie it has male(staminate) and female (pistillate) flowers on the same plant, male flowers are much more numerous and bloom several weeks before the smaller female flowers. But the most remarkable feature of Wild cucumber is his fruit, similar to a small melon and covered with spines, it becomes even more remarkable when dry, at this point, it's almost scary!